How can Gratitude improve my life in real and noticeable ways? What is the value of keeping a gratitude log or journal? Gratitude is a positive emotion of feeling thankful or grateful. I’ve read several articles about gratitude by psychologists Drs. Blair and Rita Justice, and how it influences our overall well-being. In one of their columns they explain that gratitude “is felt in the same frontal regions of the brain that are activated by awe, wonder and transcendence. From these cortical and limbic structures come dopamine and serotonin, the chemicals for feeling good inside.” Gratitude releases dopamine and serotonin into our bodies and makes us feel good. By the way, common antidepressants serve a similar function by artificially boosting serotonin levels to alleviate depression. It's good to know that we can also boost these chemicals ourselves by feeling grateful! Appreciation has also been shown to make electromagnetic heart patterns more coherent (integrated) and ordered. The Justices cite research done by psychologists Robert Emmons and Michael McCullough, who are researchers in the field of gratitude. In one experimental comparison, people who kept gratitude journals on a weekly basis exercised more regularly, reported fewer physical symptoms, felt better about their lives as a whole, and were more optimistic about the upcoming week compared to those who recorded hassles or neutral life events. Dr. Emmons is the author of several books including, “Thanks! : How the New Science of Gratitude Can Make You Happier,” which is available on Amazon. Dr. Emmons suggests that people who regularly practice grateful thinking can increase their “set-point” for happiness by as much as 25 percent, challenging the previously held notion that our “set-point” is frozen at birth. The point I’m making with all of this is – Gratitude may indeed improve our lives in real and noticeable ways, directly benefiting us mentally, emotionally, physically, and spiritually. So, why not consider making it a practice, which is as easy as choosing thoughts of appreciation and gratitude – regularly and consistently. To support you in creating a new and higher happiness set point, I suggest you start a gratitude journal, in which you write down what you are grateful for – once or twice per week. Don't just go through the motions. Set your intention to be happier. Research by psychologist Sonja Lyubomirsky and others suggests that journaling is more effective if you first make the conscious decision to become happier and more grateful. Great Holiday Gift Idea – Gratitude! I’m inviting all of us to make GRATITUDE our most important gift of the holidays! So, in addition to starting your gratitude journal and writing down for whom and what you are truly grateful – ALSO consider giving others the gift of your gratitude! Let other people in your life know how much you appreciate them, how you are grateful to them, how much you care about or love them. Compliment others, positively acknowledge them – in person, through email or holiday greeting cards – and even in your meditations or prayers. Stretch a little outside of your comfort zone, and say thank you to more people and in more ways than you have in the past. 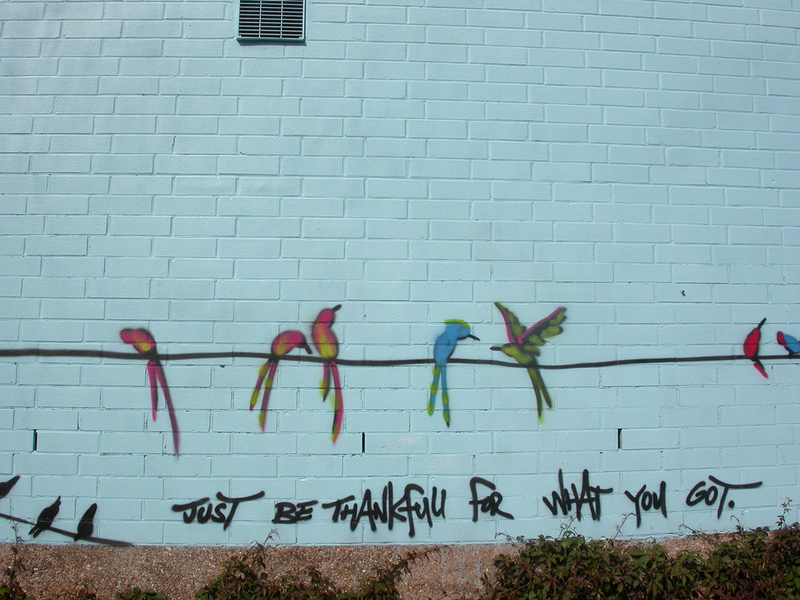 As my holiday gift of gratitude, I close with these inspiring quotes on being grateful. Feel free to share these gifts with others!